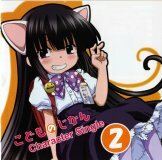 This CD contains an image song to the TV anime Kodomo no Jikan. The "Attention!" track (around 1 minute) has a message by Kuro saying, "Don't copy the CD". Rin (Kitamura Eri) and Mimi (Kadowaki Mai) also speak a little. The "Break Time" track (under 2 minutes) is a short talk by Rin, Kuro, and Mimi. This CD was released together with two other singles.